ThinkGenetic’s growth has reached an exciting milestone – interns are joining us from the fields of genetic counseling, marketing, and pharmacy! Starting this fall, ThinkGenetic is proud to work with three incredible and dedicated students: Georgia Loucopoulos, Courtney Burt, and Taylor Mitchell. While these individuals are not only impressive on paper, each is eager to help ThinkGenetic achieve its mission of reaching and empowering those living with genetic conditions. In addition, each intern will gain valuable knowledge and insights about the consumer healthcare space, digital technology, medical genetics concepts, and critical components that intersect in someone’s information journey – such as education, awareness, diagnosis and treatment. 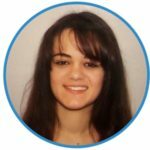 This week we are highlighting our intern from the Emory University School of Medicine Genetic Counseling Training Program, Georgia Loucopoulos. Previous Work: Intern at Smilow Cancer Genetics and Prevention Program, part of Yale Cancer Center. Studied autoimmunoblastic T-cell lymphoma (AITL), Pharmacology lab, Yale Medical School. Muhlenberg College has an award-winning peer tutoring program, and I was a tutor for three years. In my senior year, I received the Tutor of the Month award based on the caring and encouraging way I tutored, and my work in expanding the program’s genetics tutoring services. I have incredibly good memory recall. I can remember events from when I was three or four years old. I can also recite considerable portions of the Harry Potter books. In addition, I love to sing. Growing up, I was in many different choirs and solo singing competitions. Unfortunately, I had to give up this passion in college – but I still sing to my steering wheel! I like watching YouTube videos. Specifically, I enjoy watching clips from my favorite movies and TV shows, as well as music videos. Thanks to all the videos on ThinkGenetic’s YouTube channel, I could get lost for even longer on there! Apart from graduating and becoming a genetic counselor, the number one thing on my bucket list is to travel to all 50 states. So far, I’ve been to 24 of them. I first heard about ThinkGenetic from Founder, Dawn Laney, genetic counselor at Emory University and one of my internship supervisors. I am excited at the opportunity that ThinkGenetic provides me to learn about a variety of genetic diseases and help people from all over the world. I look forward to supporting ThinkGenetic in its mission to provide trustworthy genetic information to help people through their diagnostic odyssey. One of the things I’ll be doing is working with a genetic counselor to help answer questions on the “Ask a ThinkGenetic Counselor” feature of the website. I’m looking forward to seeing all the questions that people ask, and to try and help them. I’m excited to be able to provide useful information and resources to those who need it. Georgia, I am a Muhlenberg College graduate, and I am also a patient with a rare disease. It warms my heart to hear that Muhlenberg inspires your future, as it has mine for decades. Hello Donna! It’s always nice to hear from a fellow Muhlenberg alum! It truly is a wonderful school. I’m happy to say that I am not the only Muhlenberg graduate here at ThinkGenetic. Just goes to show how many more futures Muhlenberg College has inspired, especially in science and medicine. And thank you for letting ThinkGenetic assist you with your diagnosis. I hope that the information you found was helpful and educational.